One of the greatest pleasures of being a part of the mystery writing community is the friendships you form with other writers, and getting to know them by their various names. The next best thing is celebrating with them each new book they launch. 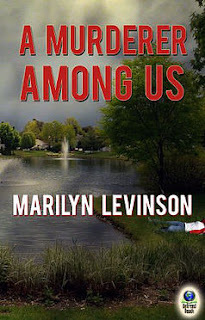 Marilyn Levinson was one of the first people I met when I started attending writers’ conference. Since then, I’ve followed her career and enjoyed all her books. 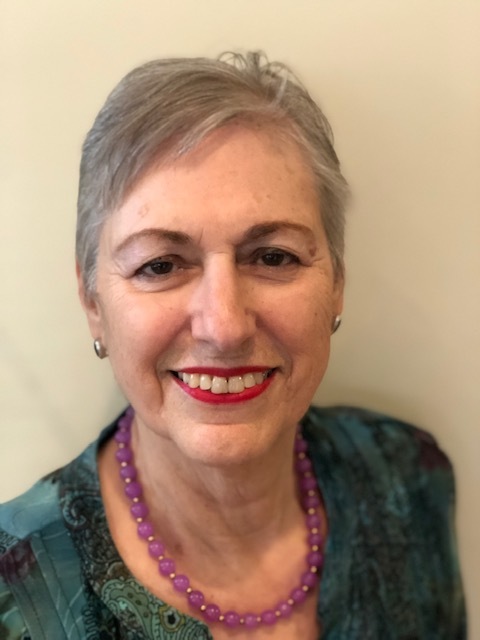 When I saw that Marilyn has a new series, the Haunted Library Mysteries, written under the pen name of Allison Brook, I was anxious to hear what she had to say about Read and Gone, her latest book, and about her new identity. 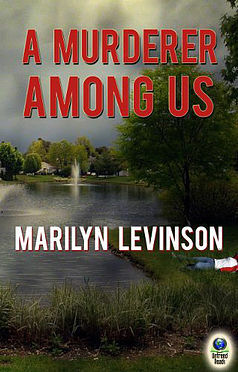 Welcome, Marilyn/Allison, to Writers Who Kill. Read and Gone deals with murder, the greed of several individuals searching for stolen jewels, and complex family relationships. What do you say to individuals who think cozy mysteries only feature lightweight stories? Like any genre, cozies—and there are many, many of them—range from breezy, light-hearted stories to ones that include serious issues. I can only write the type of book that I love to read. 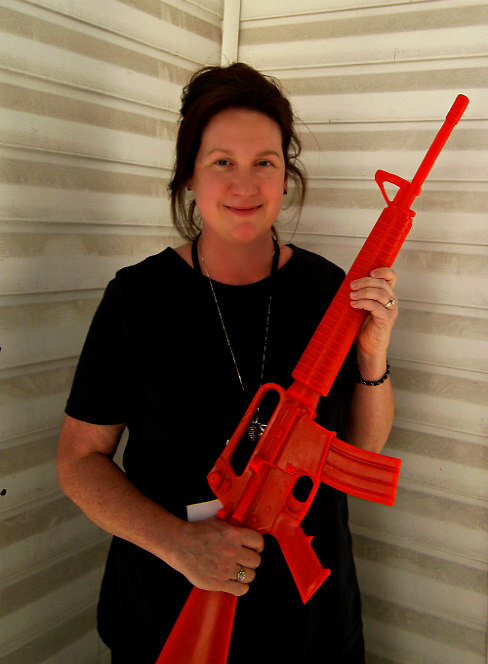 My characters are three-dimensional, with strengths, secrets, and problems. I find that whatever "cause" appears in my mystery is an intrinsic part of the storyline. I love writing about my characters' relationships with one another and how they often change over the course of the novel. Carrie’s criminal father deserted the family years ago, and as a result, she has mixed emotions when he turns up in her life again. How does she deal with her deep resentment against her father and help him when he is injured, without being drawn into the world of jewelry heists? Because her father is a career criminal, Carrie is law-biding and honest. 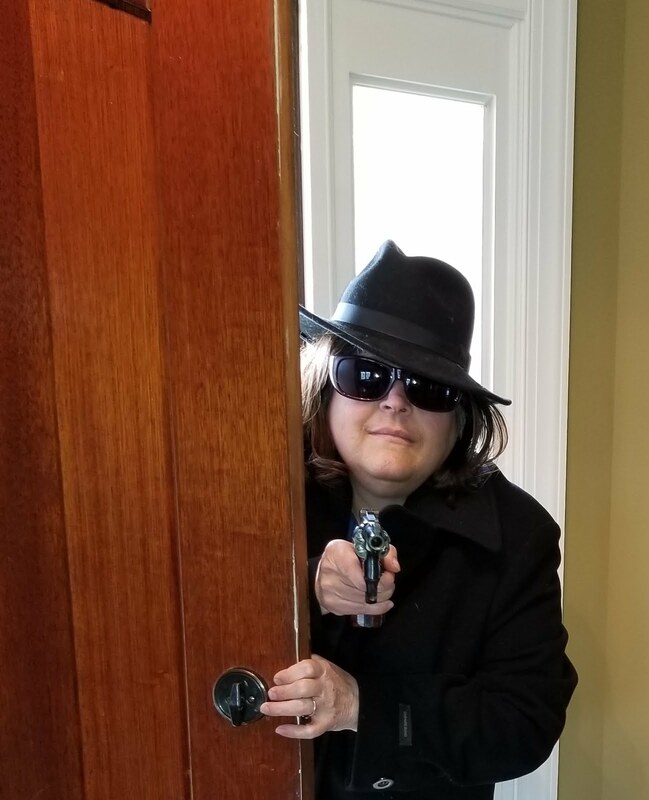 She refuses to help Jim (she thinks of him as Jim) retrieve his half of the heist. But when he's accused of murdering his double-dealing partner, she knows he's not a murderer and sets out to prove his innocence. For the first time in ages, Carrie and her father spend time together. Jim tells her how sorry he is for not having been there for her when she and her brother were growing up. He shows her in many ways—like buying a Christmas tree and decorations for her cottage—that he wants them to have a closer relationship. In the end, they both make changes—Jim in his lifestyle; Carrie in her attitude toward him. It was amazing how many of Carrie’s acquaintances were lured by a cache of jewels. What is it that would make law-abiding citizens go after stolen goods? The people who go after the jewels all want them for various reasons. In most cases, to change their present lives to something they imagine would be better. The jewels were stolen so these so-called law-biding citizens, see them as belonging to no one, when in fact they do belong to someone. Read and Gone is more suspenseful than your previous book in the Haunted Library series. With lots of cozy writers moving into suspense and thrillers, have you given any thought about going that route? 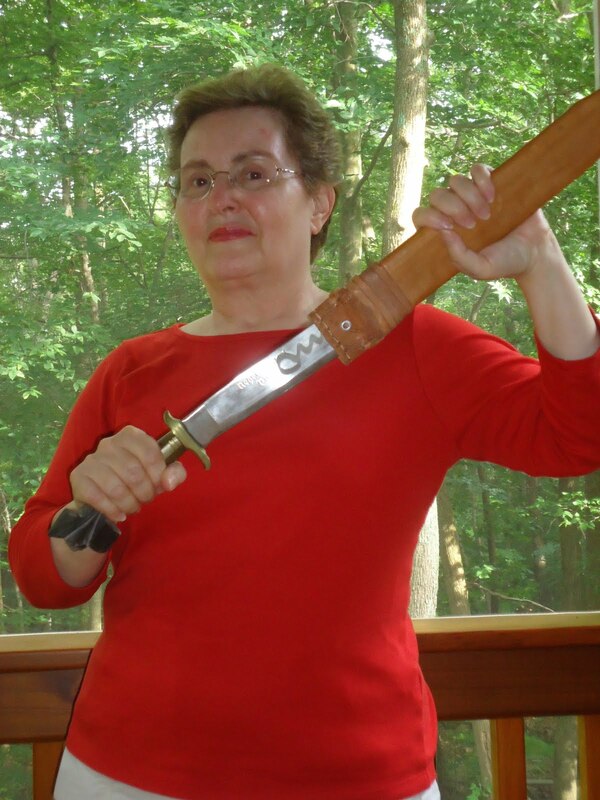 I did write two romantic suspense novels. So far, one of them, Dangerous Relations, has been published. Romantic suspense novels include mystery and romance elements as well as a sense of suspense. I find that each of my books takes on its own form of development. There is a sense of suspense in Read and Gone as many characters go in search of the gems. Who will find it? Who else will be murdered? Carrie works in a library haunted by a former library aide, Evelyn, whom only Carrie and a young child can see. Why doesn’t Evelyn help identify the murderer and make Carrie’s life easier? Evelyn isn't always as helpful as Carrie might wish. For one thing, Evelyn's niece Dorothy, the reference librarian, isn't a very nice person. While Evelyn dotes on Dorothy, she's also ashamed of some of the things Dorothy does and says. Therefore, she won't always tell Carrie everything she knows for fear of "looking bad." She also has her own agenda and is ashamed of a few things she herself has done. Smoky Joe is the library’s resident cat. Carrie discovers that there are lots of benefits having a cat at the library during the day. Please tell us about them? Smoky Joe plays a big part in solving the mystery in READ AND GONE. He has the run of the library, which gives Carrie the opportunity to do the same, while pretending she's looking for Smoky Joe. You wrote the Haunted Library Series using the pen name Allison Brook. Why the pen name? That was done at my [new] publisher's request. 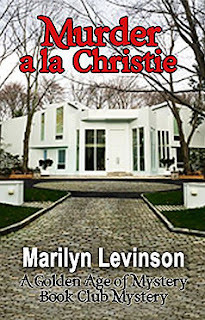 I'd published children's books, a romantic suspense, and other mysteries as Marilyn Levinson. Most people know that Allison Brook is me, Marilyn. One thing I admire particularly about your writing is your broad vocabulary. Do you ever have to stand up to an editor about your choice of words? Well, thank you! I don't remember ever having a problem defending my choice of words. To me, the word has to sound right. I'm very aware of the cadence of a sentence. I've had an editor question the word "shiva" because she was concerned that the general public might not know it's part of the Jewish tradition of mourning after a death in the family, but I felt I'd made its meaning very clear via the context of the text. As a former Spanish teacher you started out writing novels for young readers. What prompted the move to mysteries? Writing is such an isolated activity, yet you’ve written that one of the rewards of writing is sharing the camaraderie and support of your fellow scribes. How do you form these relationships? I find the mystery writing community to be very supportive. I've made wonderful friendships through listservs like the Guppies. Some of these people I will never meet in person. Some—like you and me—get together at conferences and catch up at dinner or over a drink in the bar. Grace, I can't even remember how or when we met. Do you remember? I understand that you are going to be attending Bouchercon, one of the world’s largest mystery fan conferences. What do you enjoy most about attending a conference like this and other conferences? Would you recommend them for writers just starting out? I go to very few conferences. I love Malice and go there most years. This past year was very special because my novel, Death Overdue, was a nominee for Best Contemporary Novel. What an honor!! This year I'm venturing to go to Bouchercon, which I understand is HUGE, in every sense of the word. I originally signed up because a writing friend advised me to go. I did, but then she had to back out. But I will have friends there. I'm thrilled that my publisher and marketing associate will be taking me out to lunch. AND I have a panel Sunday morning. Conferences are great for meeting people in the flesh—your writing associates, friends, and fans. While conferences might prove daunting to writers not yet published, they are a wonderful way to meet people sharing your interest. I’d advise first attending a small conference, if possible, in your state. Be sure to let the writers on your listserv know you’ll be attending a conference because people will often arrange beforehand to meet for lunch or dinner. This is how I met some of my good friends. 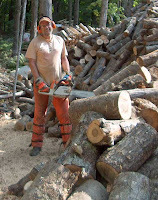 What are you working on now? Also, what’s next for Carrie and her friends? I'm almost finished with Book Number Three of the Haunted Library series. In this mystery, a member of the library staff is murdered. Carrie's best friend Angela is preparing for her wedding, and Carrie's boyfriend Dylan will soon be working closer to home. Thank you, Marilyn. Have a great time at Bouchercon. Sounds delightful, Marilyn - I love the way Smokey Joe is incorporated into the stories, too. 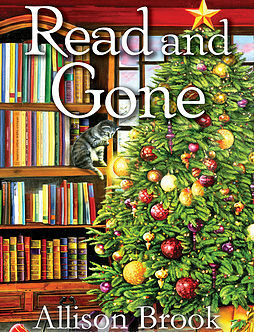 I'm looking forward to reading Read and Gone. Your latest sounds like a fun read! Congratulations on your release and enjoy Bouchercon. Thank you, Marilyn, for the fun interview. And, yes, I do remember when we met--while looking at identical black shawls being sold by a vendor at Malice years ago. After conferring with each other, we bought them. I hope you've enjoyed yours as much as I have enjoyed mine. Not only did I get a good addition to my wardrobe, I got a terrific friend in you. Marilyn, I've enjoyed reading all of your books. I'm sure I'll like this one, too. I'll put it on my "list." 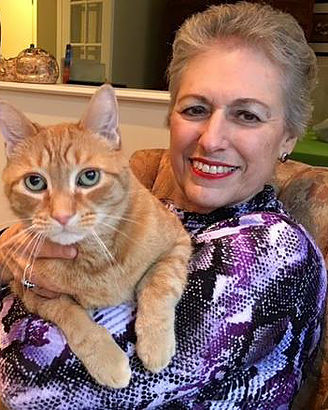 Thanks, Grace for inviting me to be your guest on this wonderful blog. I still have that black shawl-like top. And I'm excited about your new series that will be out soon. Kait—Smoky Joe has a big role in READ AND GONE. And he's in every story—as cats manage to make themselves known. Thank you, Margaret and E.B.! Now I must go pack for Bouchercon. What is it about cats and libraries or bookstores? I had a Smokey Joe years ago. He looked just like the cat on the cover of READ AND GONE. He loved draping himself over the book someone was trying to read, and his favorite hiding place was lying between the tops of books and the next shelf up on a bookcase. Sounds like you are a versatile writer for both YA and adult. 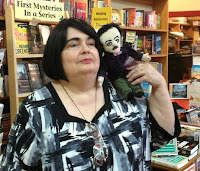 Marilyn, I've met you at Malice Domestic and I've read some of your books and enjoyed them. I have a cat who climbs up on my lap when I'm reading a book which is a little frustrating at times. If she isn't on the book she's washing my hand or arm which isn't very pleasant either. I don't know. 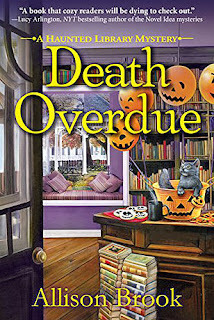 I had no idea there were other mysteries that had a library as a setting until my first in this series came out. And as for a cat…well, naturally, a cat. How nice to know there was another Smoky Joe, that he looked like my Smoky Joe AND loved books! Yes, we've met at many Malices. My Sammy loves to climb on my lap when I'm reading, too, but he doesn't wash me like your cat does. What a great interview, Grace and Marilyn! The questions and answers were interesting and informative. The best to you both as you continue on your writing journey. Look for another interview of Marilyn/ Allison in First Draft's next issue!